Unique among North American raptors for its diet of live fish and ability to dive into water, Ospreys are a common sight soaring over shorelines, patrolling waterways, and standing on their huge stick nests, white heads gleaming. Hunting Ospreys are a picture of concentration, diving with feet outstretched and yellow eyes sighting straight along their talons. Ospreys are very large, distinctively shaped hawks. Despite their size, their bodies are slender, with long, narrow wings and long legs. Ospreys fly with a marked kink in their wings, making an M-shape when seen from below. They are brown above and white below, and whiter overall than most raptors. From below, the wings are mostly white with a prominent dark patch at the wrists. The head is white with a broad brown stripe through the eye. Juveniles have white spots on the back and buffy shading on the breast. Adults are about 21 to 23 inches in size (54-58 cm), with a weight of about 49 to 71 oz (1400-2000g). Their wingspan ranges from 59 to 71 inches (150-180 cm). Unable to dive to more than about three feet below the water’s surface, Ospreys gravitate toward shallow fishing grounds, frequenting deep water only where fish school near the surface. Ospreys nest in a wide variety of locations, from Alaska to New England, Montana to Mexico, Carolina to California; their habitat includes almost any expanse of shallow, fish-filled water, including rivers, lakes, reservoirs, lagoons, swamps, and marshes. Whatever the location, Osprey nesting habitat must include an adequate supply of accessible fish within a maximum of roughly 12 miles (19.3 km) of the nest; open, usually elevated nest sites free from predatory mammals such as raccoons, and a long enough ice-free season to allow the young to fledge. 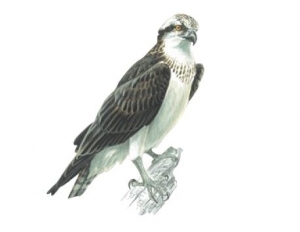 The Osprey is the only hawk on the continent that eats almost exclusively live fish. In North America, more than 80 species of live fresh- and saltwater fish account for 99 percent of the Osprey’s diet. Captured fish usually measure about 6–13 inches (15 to 33 cm) in length and weigh one-third to two-thirds of a pound (0.2 to o.3 kg). The largest catch on record weighed about 2.5 pounds (1.2 kg). On very rare occasions, Ospreys have been observed feeding on fish carcasses or on birds, snakes, voles, squirrels, muskrats, and salamanders. Ospreys probably get most of the water they need from the flesh of their prey, although there are reports of adults drinking on hot days. Ospreys require nest sites in open surroundings for easy approach, with a wide, sturdy base and safety from ground predators (such as raccoons). Nests are usually built on snags, treetops, or crotches between large branches and trunks; on cliffs or human-built platforms. Osprey nests are built of sticks and lined with bark, sod, grasses, vines, algae, or flotsam and jetsam. Usually the male finds the site before the female arrives. The male usually fetches most of the nesting material, sometimes breaking dead sticks off nearby trees as he flies past, which the female uses to construct the nest. Nests on artificial platforms, especially during a pair’s first season, are relatively small (less than 2.5 feet in diameter and 3–6 inches deep). After generations of adding to the nest year after year, Ospreys can end up with nests 10–13 feet deep (3 to 4 m) and 3–6 feet (0.9 – 1.8 m) in diameter; easily big enough for a human. Clutch size ranges from 1-4 eggs and the incubation period lasts 36-42 days. “fish-flight.” With dangling legs, often clasping a fish or nesting material in his talons, the male alternates periods of hovering with slow, shallow swoops as high as 600 feet (183 m) or more above the nest site. Sustaining this display for 10 minutes or more, he utters repeated screaming calls while gradually descending in an undulating fashion to the nest. Ospreys are a conservation success story and overall their populations grew by 2.5% per year from 1966 to 2015, according to the North American Breeding Bird Survey. Partners in Flight estimates a global breeding population of 500,000 with 21% spending some part of the year in the U.S., 28% in Canada, and 3% in Mexico. The species rates a 7 out of 20 on the Continental Concern Score. Osprey is not on the 2016 State of North America’s Birds’ Watch List. The species’ decline was halted by pesticide bans and the construction of artificial nest sites. Osprey numbers crashed between the early 1950s and the 1970s, when pesticides poisoned the birds and thinned their eggshells. Along the coast between New York City and Boston, for example, about 90 percent of breeding pairs disappeared. Osprey studies provided key support for wider legal arguments against the use of persistent pesticides. After the 1972 U.S. DDT ban, populations rebounded, and the Osprey became a conservation success symbol. But Ospreys are still listed as endangered or threatened in some states—especially inland, where pesticides decimated or extirpated many populations. As natural nest sites have succumbed to tree removal and shoreline development, specially constructed nest platforms and other structures such as channel markers and utility poles have become vital to the Osprey’s recovery. Sadly, a growing cause of death for Ospreys is entanglement at the nest: the adults incorporate baling twine, monofilament, and other discarded lines into their nests; these can end up wrapped around a chick’s feet and injure it or keep it from leaving the nest. • The Birds of North America, No. 441 (A. Poole and F. Gill, eds.). The Birds of North America, Inc., Ithaca. New York. • Pete Dunne’s Essential Field Guide Companion. Houghton Mifflin, New York.Audubon’s Birds of America. Macmillan Company. • North American Bird Conservation Initiative. 2016. The State of North America’s Birds 2016. Environment and Climate Change Canada: Ottawa, Ontario. • Sibley, D. A. 2000. The Sibley Guide to Birds. Alfred A. Knopf, New York.